On August 21, 2017, tens of millions of people in the United States will have an opportunity to view a total eclipse of the Sun. A total solar eclipse was last seen on the U.S. mainland in 1979, but only in the Northwest. The eclipse this summer will sweep a narrow path across the entire country—the first time this has happened since 1918. The U.S. 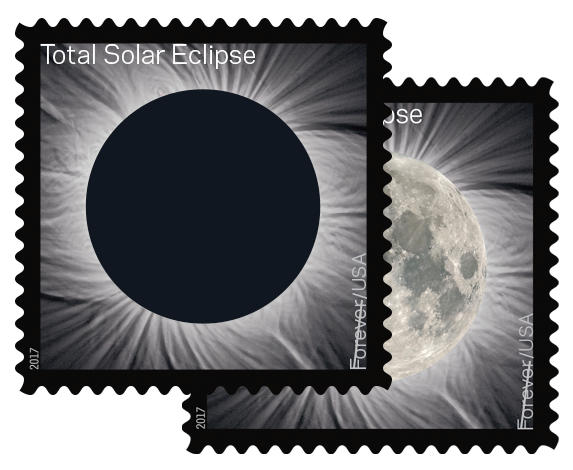 Postal Service® anticipates this rare event with a stamp celebrating the majesty of solar eclipses. The Total Eclipse of the Sun stamp is the first U.S. stamp to use thermochromic ink, which reacts to the heat of your touch. Placing your finger over the black disc on the stamp causes the ink to change from black to clear to reveal an underlying image of the moon. The image reverts back to the black disc once it cools. The back of the stamp pane shows a map of the eclipse path.You can preserve the integrity of your Total Eclipse of the Sun Forever® stamp pane with our protective sleeve specifically designed for stamp preservation. The stamp uses a photograph taken by astrophysicist Fred Espenak of a total solar eclipse that was seen over Jalu, Libya, on March 29, 2006. Mr. Espenak also took the photograph of the full moon that is revealed by pressing upon the stamp image. The reverse side of the stamp pane shows the path across the United States of the forthcoming August 21, 2017, total solar eclipse and gives the times that it will appear in some locations. A total eclipse of the Sun occurs when the Moon completely blocks the visible solar disk from view, casting a shadow on Earth. The 70-mile-wide shadow path of the eclipse, known as the “path of totality,” will traverse the country diagonally, appearing first in Oregon (mid-morning local time) and exiting some 90 minutes later off the coast of South Carolina (mid-afternoon local time). A total solar eclipse provides us with the only chance to see the Sun’s corona—its extended outer atmosphere—without specialized instruments. The corona during an eclipse looks like a gossamer white halo around a black disk, or like the petals of a flower reaching out into space. Art director Antonio Alcalá designed the stamp. The Total Eclipse of the Sun stamp is being issued as a Forever ® stamp. This Forever® stamp will always be equal in value to the current First-Class Mail® one-ounce price.